As the legal tampering period of NFL free agency got underway on Monday, and the Buffalo Bills wasted no time in building around quarterback Josh Allen. The former top-10 pick had limited options and little protection a season ago, grinding through an up-and-down (but mostly down) rookie campaign. General manager Brandon Beane got started early this offseason to fix those glaring offensive holes. The Bills’ nine free agent signings thus far consist of four receivers, a running back and three offensive linemen (as well as a cornerback). That isn’t a coincidence — Allen was the second-most pressured quarterback in 2018, and despite having the highest deep-attempt rate, he completed only 36.5 percent of his attempts targeted 20 or more yards downfield (27th). With the additions of a deep threat in wide receiver John Brown, a big body in tight end Tyler Kroft and proven pass blockers Mitch Morse and Ty Nsekhe, the Bills’ offense will likely run in a far different fashion in 2019 than the sputtering unit it was this season. Brown is perhaps the most enticing signing, mainly because of Allen’s big arm. 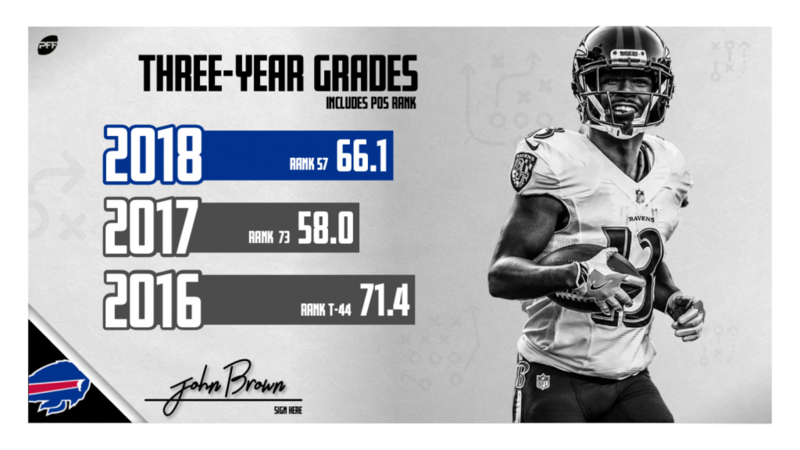 With quarterback Joe Flacco at the helm of the Baltimore Ravens’ offense through the first nine weeks, Brown accumulated the most deep targets in the league. While his production on those targets was limited, due in part to two drops, Brown can stretch the field far better than any of the Bills currently rostered receivers. Allen and Brown will become a feared combo should they build rapport. After four years in Cincinnati, Kroft joins the Bills and fills a much-needed void as both a pass-catcher and blocker. His 2018 campaign was cut short due to injury, but he broke out in 2017 to set him up for a decent payday this offseason. That year, he played more than 400 blocking snaps all while hauling in 71.2 percent of his receptions and racking up seven touchdowns. Perhaps, he can replicate that success a year removed from a broken bone in his foot. Morse received the largest contract of the signings — and for good reason. 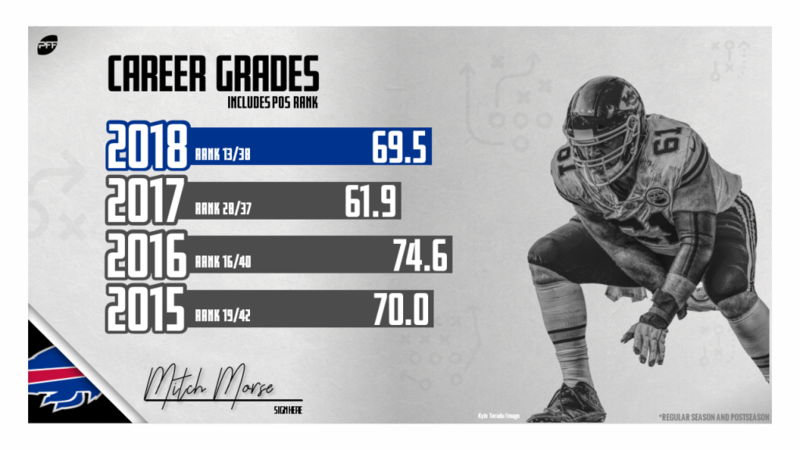 His 81.2 pass-blocking grade ranked sixth among centers in 2018, and he was one of four centers with 600-plus snaps who did not surrender a sack. Ty Nsekhe earned five starts this past season, earning 70.0-plus pass-blocking grades in three of them. He has proven himself to be a solid option at guard or tackle. After allowing five sacks and 19 pressures on 184 pass-blocking snaps in 2017, Nsekhe stepped up and surrendered just one sack and 11 pressures on 249 pass-blocking snaps in 2018. For the Bills, giving Allen a few weapons and some protection has become priority No. 1 as they look to get out of the AFC East basement. With a young quarterback who has a cannon of an arm and likes to use it, pass protection is imperative. The Bills’ aggressive offseason thus far is proving to address both those needs.